Glaucoma is a group of eye disorders that cause damage to the optic nerve, which carries data from the eye to the brain. In most cases, glaucoma is linked to higher than normal pressure inside the eye, which is called ocular hypertension. If untreated, glaucoma leads to a loss of peripheral vision and eventual blindness. During regular eye exams, intraocular pressure (IOP) is tested with an instrument called a tonometer. Typically, the eye is first numbed with anaesthetic drops and a dye called fluorescein is instilled with the drop. Next, there is a small probe rested gently against the surface of the eye for a very short time. An IOP reading that is abnormally high indicates that there may be too much fluid, or aqueous, in the eye. This is usually because it is not properly draining or there is an excessive rate of production. The IOP should normally be between 10 to 21mmHg. This is a unit of measurement that is based upon the amount of force needed to flatten the central cornea. It’s a little like estimating the air pressure in a rubber ball by giving it a gentle squeeze. If you know exactly the pressure with which you squeezed the ball, you can estimate its air pressure based on how resistant it was to indentation. If the IOP is above 30mmHg, then your risk of developing vision loss from glaucoma is 40x higher than those with a normal pressure of 15mmHg. A method for detecting and measuring vision loss due to glaucoma is visual field testing. This test involves looking straight ahead into a bowl-like machine and pressing a button when you see a blinking light within the bowl. Visual field testing produces a map of your peripheral vision, both its size and sensitivity, with which your optometrist can determine whether the optic nerve is functioning normally. 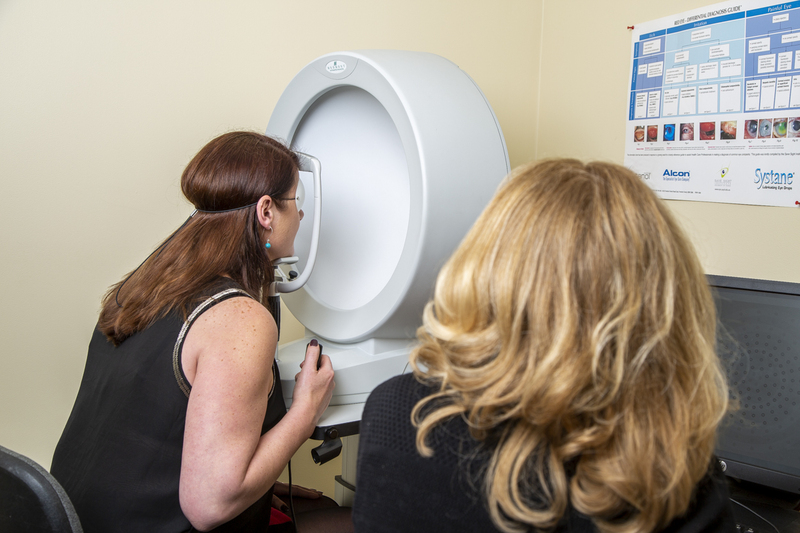 This test can be repeated regularly to ensure that blind spots are not developing due to optic nerve damage, or to determine the progression of your condition once glaucoma is diagnosed. All treatments for glaucoma aim to lower the pressure inside the eye, and thereby protect the optic nerve from damage. Treatment for glaucoma can involve topical medication, lasers or surgery, depending on how severe the case. In most cases, eye drops are the first line of treatment and can reduce IOP quite effectively without physically interfering with the eye. For more severe cases, your optometrist will recommend referral to an ophthalmologist who may initiate laser or surgical treatment to improve the drainage of fluid from inside the eye. Please note that glaucoma treatment aims only to limit, or control, the loss of vision from optic nerve damage. It is not a cure and requires ongoing use of drops and follow-up visits with your optometrist or ophthalmologist to ensure that the treatment is effective and your risk of further vision loss is minimised. Regular follow-up visits typically occur every 1 – 6 months and involve checking the eye pressure, measuring the visual field and photographing the optic nerve. Once good control of the disease is established, follow-up visits may only be required annually.